GBG entry, so I was here to get my tick. 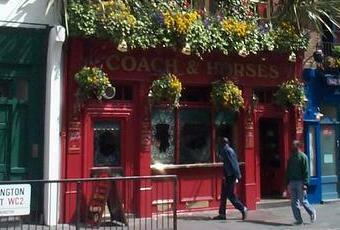 A locals pub in the heart of Covent Garden - complete with dog walkers. Irish pub with plenty of whiskies, "the best Guinness in London" and a decent pint of Tribute. I always try to find time to visit this little diamond; like many of my favourites it is small, friendly & seemingly out of place in its inner city location. A couple of bantering locals, an efficient & equally bantering bar person & a great pint of Tribute (4.10) made for an enjoyable half hour. Great little place with top notch Guinness. However, I cannot say the same for the nobs at the bar who seemed to regard the whole place as their own and refused to get the hell out of the way for people looking for a drink. Would def go back though. Called in yesterday mid afternoon, astounded to find a proper friendly local pub in the midst of all the tourist traps of the area. Highly recommended.